KRUPT (AUS) (Chestnut 2005-Stud 2010). Winner at 2, A$217,450, STC Todman S., Gr.2, 2d AJC Kindergarten S., Gr.3. Half-brother to SW Anevay (VRC Talindert S., L). Related to SW Flying Spur (STC Golden Slipper S., Gr.1), SW Encosta de Lago, etc. Sire of 36 rnrs, 14 wnrs, inc. SP Cashed, Trupt and of Nardoo, Electric Tribute, Zinging, Mr McBat, Termele, All Krupt, Island Jewel, London Lady, Paravidya, Rosie's Dream, Veselka, Yang Jiang Power and of the placegetters Jen See See, Kruptor, etc. Trupt (f. by Krupt). 3 wins. See below. Shaabam (g. by Barely a Moment). Winner at 1350m in Aust. Tiona (Blevic). 5 wins. See above. The Gee Train. Winner at 1250m in 2015-16, SAJC Projection Graphics P., 2d SAJC Farmers Union Iced Coffee P.
Ambroc. 2 wins at 1050m, SAJC Umatilla H.
Fraacharm. 6 wins from 1350m to 2050m, 3d SAJC ACG Security H., Allan Scott Park Morphettville H., Spring Racing at Morphettville H.
Kala Charm. 4 wins from 1100m to 1700m in Aust. Fager Son. 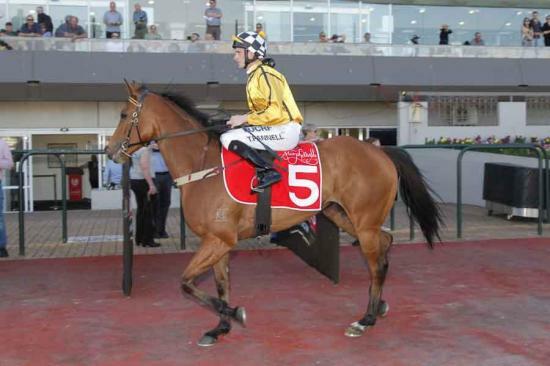 Winner at 2050m in Aust. Paris Charm-Top Seed (Mal.). Winner at 1700m, Singapore TC Class 5 H., 2d Singapore TC Classes 4 & 5 H., Class 4 & 5 H., Class 5 H.-3 times, Class 4 H., 3d Singapore TC Restricted Terms H., Class 5 H., Class 4 H.
Oh Brother (Amen Brother). 11 wins-4 at 2-from 900m to 1800m, A$157,055, SAJC Beneficial Finance H., Sovereign Red H., Skyjack H., Millefleurs H., Canny Lass H., Monfries & Burchell S.H., Ansett Australia H., Mobil Oil H., 2d SAJC Tattersall's Cup, L, Robert A Lee S., L, Morphettville Sprint H., L, Walter Brown S.H., L, Pullman Future S., Just a Dash H., Two-Up H., Nubrik Hallett H., Sunkist H., Australia Florists Welter H., Sizzler Welter H., Racing Ministers Welter H., 3d SAJC 2/48 Battalion H., Young Man H., Emblem Boy H., Gallipoli H., 4th SAJC West End Breeders S., Gr.2, Schweppes Lemonade S., Gr.3, Fulham Park P., L.
Lady Shalford. Winner at 2, SAJC Vanellus 2YO H. Producer. Da Capo (Encores). 7 wins-1 at 2-from 1200m to 2500m, A$181,790, MVRC John d'Arcy H., Mitsubishi Outlander H., 2d Cranbourne Cup, L, MVRC Winbet H., MRC Master Avenel H., Lady Medalist H., 3d VRC Queen Elizabeth S., Gr.2, Brian Beattie H., MVRC AAPT Brisbane Lions Football Club H., Ron Davis Carpets H., Bairnsdale Cup, MRC Prince Salieri H.
Silent Attitude. 6 wins from 1200m to 1950m, A$169,400, Oakbank RC Oak H., SAJC Mario Ionni H., Oakbank RC Alma Hotel Young Members H., 2d VRC St John P., SAJC CAMMS Budget Management H., Portobello Magic H., Adelaide Cup Day H., Tattsbet H., 3d SAJC Thoroughbred Racing SA Provincial Series Final H., Centrebet H.
Batarshi. 6 wins from 1500m to 2400m, A$103,350, MRC Maple H., Ray Ribbon H., Winooka H., 2d VRC Shamrock Travel H., MRC Journal H., MVRC Sydney Entertainment Centre H., 3d MRC Big Philou H., Bounding Away H., Basha Felika H.
Red Shoes Kelley. 2 wins at 1000m, 1050m in Aust. Producer. Race Record: 9 Starts 3-2-1 A$99,450. 3 wins at 1100m, 1250m, A$99,450, to 2015-16, SAJC Mitty's H., Hughes Limousines H., 2d SAJC David Balfour Memorial H., Projection Graphics H., 3d SAJC Lightning S., L.